One of my prized procession is this autographed photo of Anthony Forrest. Who is Anthony Forrest? Answer after the jump. Anthony Forrest, born July 25, 1951 is best remembered as the Sandtrooper commander in Star Wars: A New Hope ,dazed by Obi-Wan Kenobi’s Jedi mind trick at the Mos Eisley roadblock. Famous lines includes, “How long have you had these droids?”, “Let me see your identification”, “These aren’t the droids we’re looking for” and of course “Move along move along” which you may view it below. Mr Anthony Forrest is also a honourary member of the MEPD, a 501st Legion detachment for Sandtroopers and makes frequent appearances at fans events. Check out his website here. P.S. 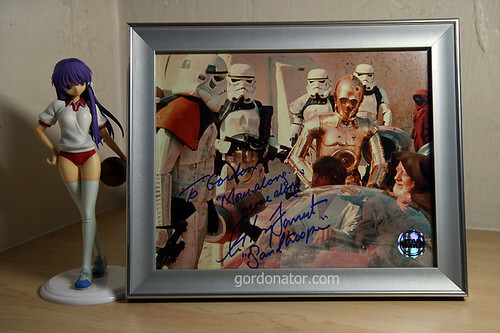 My autograph collection pales in comparison to my sister who owns a huge assortment of autographed pieces. Click here to see for yourself. hi was in singapore til yesterday. saw ur friends at the thai embassy. ope you got my msg. tc! hi there! i was there on sunday afternoon but all the troopers has left already. got your msg and tried text messaging u as i was unsure who u are. was away on monday and back to work on tuesday. if you haven’t seen this yet. oohhh, So He is Anthony Forrest. I dont have anything autographed yet. Have you mentioned him before? My friend’s boyfriend will e so jealous if he knows about it. he should join the 501st Legion!!! !